We are delighted to welcome Dr. Lisa Funnell in from the cold to hear about her new book For His Eyes Only, a collection of essays on the femininity and feminism in the Bond series. It’s impossible to discuss the world of James Bond without examining the fascinating female characters that make the series so memorable. From Honey Rider and Wai Lin, to Gala Brand and Camille Montes, the women of Bond have contributed immeasurably to the global success of the franchise. Although several books have been written about the Bond Girl phenomenon over the years, they’ve largely been of the pictorial coffee table variety. Thankfully, the release of “For His Eyes Only: The Women of James Bond” changes all that. 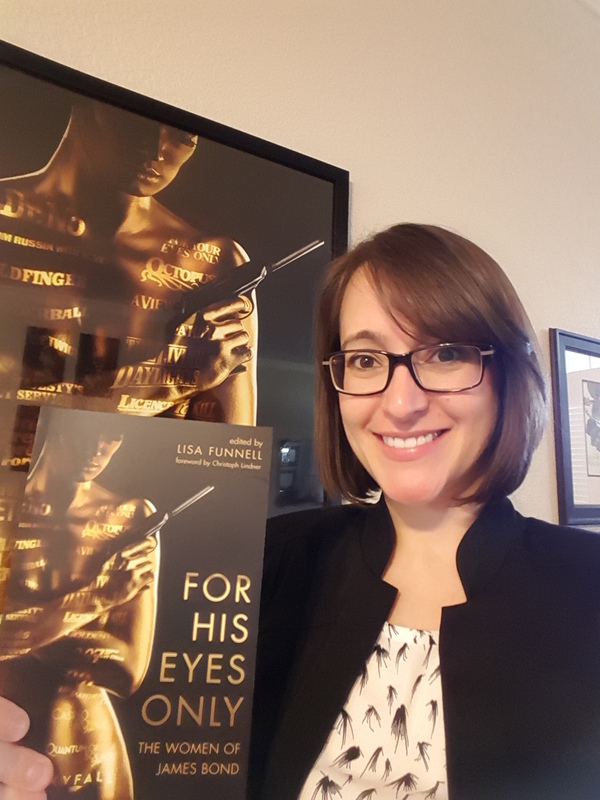 An in-depth anthology of essays that offers a scholarly look at the representation of women in the Bond universe, the book was conceived and edited by award winning author Dr. Lisa Funnell, Assistant Professor in the Women’s and Gender Studies Program at the University of Oklahoma. I recently spoke with her about the new book, and about the role of women in the 007 series. Matthew Chernov: Before we discuss your book, could you tell me about your introduction to the world of James Bond? Where did your interest in the series begin? Lisa Funnell: My interest began during my Master’s Degree. I took a cultural theory class with Jim Leach, who actually contributed a chapter to this collection. Getting to work with Jim again, ten years later, has been amazing! He’s someone who really encouraged me to study James Bond. The topic of the course was the James Bond phenomenon, so we read a couple of the novels and watched the movies. I was already familiar with the film franchise, since my dad was a big fan. We watched the Bond series together while we had Sunday dinners in front of the TV. Especially the Roger Moore films, those were our favorites. So I ended up doing a Master’s Thesis on the Bond Girl phenomenon, and I created a topology where I examined various Bond Girls. And even though I continued my studies by looking at Chinese warrior women in cinema, of course inspired by Michelle Yeoh’s performance in “Tomorrow Never Dies,” I kept studying James Bond. That’s partly because they kept coming out with movies! And I found that as I became educated about women in film, I had a lot more to say about gender and James Bond. And my research in recent years has certainly taken off, particularly with this book. MC: “For His Eyes Only” is a comprehensive study of femininity and feminism in the Bond series. Considering how important women are to the franchise, why has it taken so long for this topic to be treated seriously? LF: I think in part it’s because the women in the series are written off. Whether we’re talking about the novels or the films, women in the franchise are often assumed to be decorative, or pin-ups, or playthings for James Bond. One of the issues we have is that all of the women in the series are referred to collectively as “Bond Girls.” That really does collapse all women who work or participate in the series into a single category. One objective of the book was to untangle this web and to look at the full range and diversity in terms of female characterization. That includes both primary and secondary figures who are treated and represented differently in the narrative. We deal with protagonists and antagonists, since the representation of heroic women is quite different than the representation of villainous women. So I have a feeling that it’s because everyone is sort of collapsed under this one descriptor, and it’s easy to write off these women. At the same time, there are a lot of critics and fans, like myself, who know that the series is problematic, yet we also see some value in the representation of these women. MC: In chapter two of the book, writer Boel Ulfsdotter refers to the literary version of Tiffany Case as Fleming’s most Bondian female character, and describes her as something of an anomaly in the series. Apparently the film producers felt that way too, since they drastically rewrote her for the movie adaptation of “Diamonds are Forever.” What is it about the book’s version of Tiffany Case that makes her so unique? LF: To relay some of the arguments that Boel Ulfsdotter puts forward in her essay, the novel presents Tiffany Case as a literary counterpart to Bond, someone who’s extremely independent and career driven. Boel also talks about the consumption practices that were taking place at the time the book was written. And so then, how do you translate a character like that into a film when the franchise itself had already started to become formulaic? On screen, there were very specific dynamics concerning who Bond is, and who Bond is expected to be. And then, of course, there were rules for the women that surround him. So I do agree with Boel that the character in the film is watered down. I also think that some of the cultural politics had changed in society when the movie was made, so we have a scriptwriter trying to understand and adapt the figure of Tiffany Case, who’s certainly an anomaly in the novel. Yet she isn’t as much of one in the film, which might be why her character doesn’t get a lot of critical attention in terms of Bond scholars. MC: In “Dr. No,” Honey Rider is easily the earthiest of all the Bond Women. She’s almost primal, in a way. Curiously, that archetype hasn’t been repeated in the series. We’ve had multiple versions of the femme fatale, the damsel in distress, and the super spy, but never again this animalistic Tarzan-like figure. Why do you think that is? And could a character like Honey Rider work in a modern Bond film, or is her time simply past? LF: Wow! That’s a really, really good question! I think there are a couple of ways to look at it. On the one hand, she’s such a quintessential Bond Girl. In a sense, Fleming sort of broke the mold when he came up with Honey Rider. She has such a distinctive persona. And so, if the goal of the franchise is to give us what I call “repetition with a difference,” which is how I’d describe what’s going on in the Bond series, then I don’t think they can take the Honey Rider figure and bring her out again with much more depth. At the same time, I look at the 2006 version of “Casino Royale” and I’d argue that Daniel Craig is the most like Honey Rider! 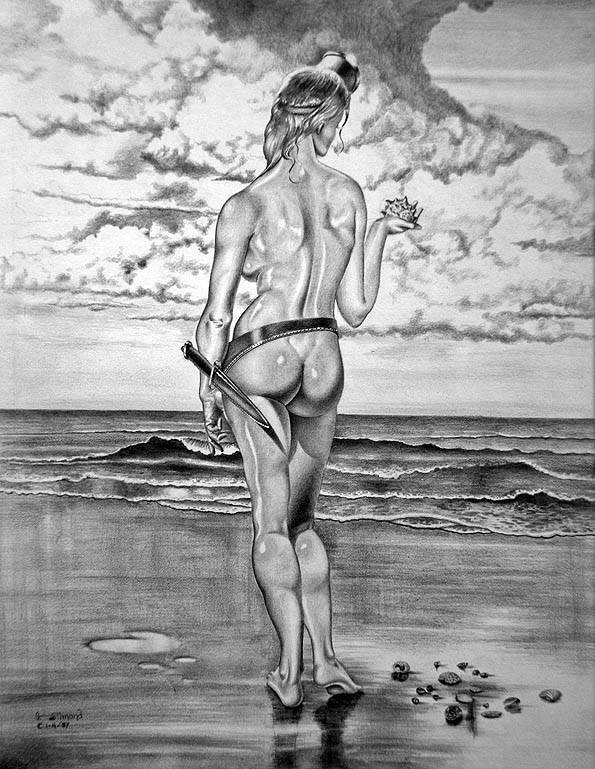 He’s the one who looks the most like her, emerging from the sea, not once but twice, with a body that’s clearly on display! There’s an interesting hybridity in the Craig films, where various qualities and characteristics of the Bond Girls are distributed across a wide variety of different characters. This is something I’m working on in a new paper. So I think that Daniel Craig in “Casino Royale” is probably the closest we have to a modern Honey Rider. MC: Another fascinating woman from the Fleming novels is Gala Brand in “Moonraker.” She’s a very different type of female character, and the only one that Bond doesn’t end up with at the climax of the book. She’s also never appeared in any of the films. What’s your take on her character? LF: That’s a question I’ll probably be able to answer in about three weeks, because I haven’t read “Moonraker” yet! (laughs) I’ve been making my way back through the original novels, so in about two more books I’ll be able to talk about Gala Brand! This is something that I’m really paying attention to as I read the novels. Who’s adapted? How are they adapted? And who’s overlooked? Because, although what we see matters, what we don’t see also matters. That’s what I’m going to keep my eye on as I make my way through the books. MC: Well, you’re in for a treat with “Moonraker.” In a way, Gala Brand reminds me of Camille in the film “Quantum of Solace.” They’re both very serious and have a professional relationship with Bond, rather than a standard romantic one. LF: As someone who teaches a course on gender and Bond, I speak with my students a lot about the way that the films end, and they often feel as though the endings are overdone. Why does there have to be a romance every time? With certain Bond Girls it seems so forced, whether it’s Wai Lin in “Tomorrow Never Dies,” or Melina Havelock in “For Your Eyes Only.” So there’s something quite refreshing about having Bond and his female partner go their separate ways at the end! It becomes more about two heroes who come together to work on a mission. And that’s one of the redeeming qualities, in my opinion, of “Quantum of Solace.” We get this woman who’s really just there on a mission of vengeance for herself! She works in concert with Bond, but then the two of them part ways at the end. MC: The women in the Bond series often challenge, or at times even undermine, the mainstream notions of hyper-masculinity that we associate with Bond, and your book deals directly with that subject in many of its essays. Beyond the characters that we’ve already talked about, which other women in the series strike you as particularly noteworthy in that respect? LF: When it comes to the films, I’m thinking about “Thunderball” and Fiona Volpe, where she proclaims “I forgot your ego, Mr. Bond. James Bond, you only have to sleep with a woman and she starts to hear heavenly choirs singing.” And then she defiantly adds “Not this one!” When I think about someone undermining Bond’s masculinity and being a threat, Fiona Volpe definitely does that. Unfortunately as a result, she has to die in the film, in order to restore order. I’d also include May Day in “A View to a Kill.” I think she’s an absolutely fascinating character, and Grace Jones is a fascinating woman! And I do feel that much of her star persona was just sort of interjected into the character she played. But when you look at the fact that she probably could have defeated Roger Moore’s Bond in hand-to-hand combat, and she certainly dominates him in bed, it’s a little bit sad that they have her commit suicide at the end of the film, rather than have the two characters actually fight one another. There’s a challenge in that film that never really gets resolved. But on the flip side, we also get May Day having a redemption narrative, where she gets to actually explain herself, explain her actions, and leave the film on her own terms. Maybe that’s why I find the female villains in the series so fascinating, because they’re allowed to openly challenge Bond. With that in mind, you could also add in Judi Dench’s M! The scene in “GoldenEye” where she calls him a sexist, misogynist dinosaur, and a relic of the Cold War at their first meeting was kind of interesting. She basically shows us, particularly in the ‘90s, that the world around Bond has changed. Which begs the question, has Bond changed? Can Bond change? And do we still need the Bond of old? At the end of the day, when all the chips are down, do we really need this traditional hero to come in and save the world? MC: In general, how strongly does the cinematic Bond Girl follow the character model that Fleming created in his novels? LF: I think that the literary Bond Girls have, in some ways, a strong connection with the films. There are definite character types, but the film franchise adapts them. And in the adaptation process there are a lot of changes that happen in order to fit the narrative and the style. For example, in “Casino Royale” there’s an entirely different card game, and a different representation of Le Chiffre, and, of course, a different version of Vesper Lynd, based on what’s going on in terms of the parameters of the novel versus the parameters of the film. I can see connections between the novel and the cinematic Vesper Lynd, but then I look at Eva Green’s character on screen and she’s much more defiant. She’s a lot bolder. Bond’s love for her certainly appears a lot earlier in the text. So although there are certainly some connections between the two, we also see plenty of differences. MC: What was the impetus for organizing this book? Was there a specific moment where you knew it just had to happen? LF: Basically this book came from my reaction to watching “Skyfall.” I’d studied Bond for years, and I didn’t really like the representation of women in that film. I thought it was really, really problematic, and I felt as though they were building up the legacy of Bond at the expense of women, rather than with their help. And so I was thinking about these problems, and we were at the fiftieth anniversary of the film series, and I wanted to understand what was going on in the franchise. So it sort of dawned on me that if I’m having these kinds of questions, clearly there have to be other scholars out there who were thinking the same thing. So I put a call out for papers, and I had an immense response! There were so many people contacting me, and they came up with their own topics. So I feel very fortunate. I’d love to say there was a greater master plan or design, but I think that the range of diversity in the essays shows just how much we need a book like this. There’s so much that has not been said yet, and I feel like this book opens up the conversation. And I’m glad that I finally get to share it with the world! For His Eyes Only is a collection of essays on femininity and feminism in the Bond series. It covers all twenty-three Eon productions as well as the spoof Casino Royale (1967), considering a range of factors that have shaped the depiction of women in the franchise, including female characterization in Ian Fleming’s novels; the vision of producer Albert R. Broccoli and other creative personnel; the influence of feminism; and broader trends in British and American film and television. The volume provides a timely look at women in the Bond franchise and offers new scholarly perspectives on the subject. Lisa Funnell is assistant professor in the Women’s and Gender Studies Program at the University of Oklahoma. She is the author of Warrior Women: Gender, Race, and the Transnational Chinese Action Star and has published extensively on gender in the James Bond franchise. 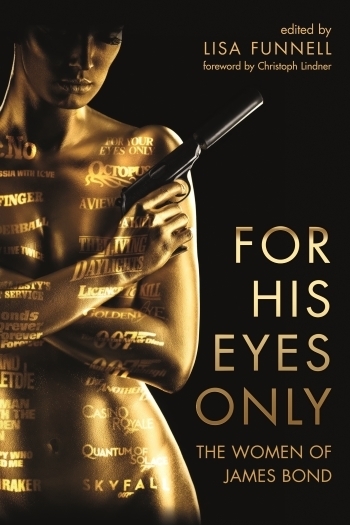 “For His Eyes Only: The Women of James Bond” is currently available from Columbia University Press and Wallflower Press. ← Win a Signed Copy of ‘The Man with the Golden Typewriter’ by Fergus Fleming! If it hasn’t been said in this interview, all Bond girls (at least in the novels) were a product of their times – a 1950’s objectified, reduced in many ways to sexual clichés, supportive woman who kept “her man” in check by her offering of sexuality, not yet consummated. But the rewards at the end would justify the means. It’s not much different today in advertising, where the reward of the purchase is balanced by the excitement of the commercial, that, unfortunately, everyone has to suffer though to the end to find some sort of fulfillment. As time marched onward and upward, the women (Bond Girls) grew with the societal expectations. We don’t have to do a litany of the characters, but suffice to say, there seems to be a reversion to the mean in the most recent films. The girls, have gone through a sea change from demure, assertive, aggressive, outright violent, and back to a reverse order. Skyfall’s gorgeous villainous broad, Severine, was almost servile in her interaction with Bond – probably from the knowledge that if she said anything to him, it would come back to haunt her – which it did. Vesper Lynd was more aggressive but couched that with the expectation of her own demise because of her relationship with the bad guy(s).